Arcadia and Foothill Extension Construction Authority officials at this morning’s event. At center in the white jacket is Construction Authority Board Chair Doug Tessitor and at right in dark jacket Board First Vice Chair Sam Pedroza. 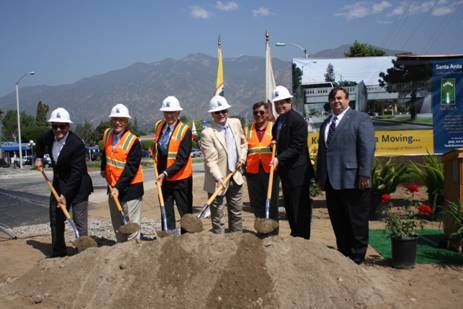 This morning, the City of Arcadia hosted a ground breaking ceremony for the Santa Anita Bridge, a new grade-separated crossing being built by the Construction Authority as part of the Pasadena to Azusa extension. The $12.5 million bridge is being paid for by the city and its residents. In 2006, after it was determined that the street traffic on Santa Anita did not meet the official requirements to mandate a separated crossing, the city took the issue to its voters. Nearly 72% agreed that they were willing to pay for the grade separation over Santa Anita Avenue rather than have a street-level crossing. [Above] is a city-provided rendering of the future bridge, as well as photos of Construction Authority Board Chairman and Vice Chairman Doug Tessitor and Sam Pedroza, along with city officials, at today’s event. As I remarked during today’s ceremony, work on Santa Anita Avenue is scheduled to begin at the beginning of May, following the re-opening of Colorado Boulevard. It will take approximately seven months to complete the extensive work necessary to lower the street in the area of the railroad crossing, as well as construct the new bridge. Long-term lane closures are planned, and we appreciate everyone’s patience during this construction activity. The businesses will be open in the area, and we encourage patronage of these businesses during this very impactful period. At today’s event, Mayor Harbicht and Councilman Kovacic both remarked about the Construction Authority’s good work. It is especially meaningful to hear positive feedback on our work and efficiency during an active construction period. We thank the city officials and staff for their continued dedication and support of the project. It is our continued partnership that helps to move this important project forward. This is great news. When a community wants something that is not in Metro’s budget they should contribute the money themselves. At $12.5 mil, I am sure that bridge is the single most expensive thing a small city like Arcadia has ever paid for. At least Arcadia and its residents have the foresight to invest in it. Once the train got rolling, it would be nearly infeasible to undo the tracks and add a bridge.